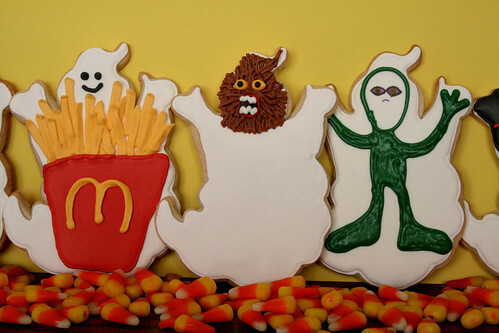 A spooky blast from the ghostly past. 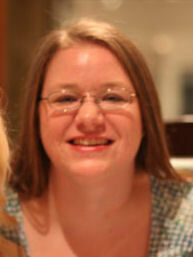 . .
Last year, my dear friend Stacy surprised me by having a beautiful ghost cutter sent to me as a gift. The cutter was copper (one of my first!) 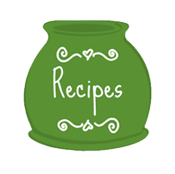 and very large (6″x5″) & detailed, and I really wanted to make something special with it. Plus, Stacy said she was super-excited to see what I would do with it! Now, the more I thought and thought about it, the more I realized that a traditional approach with just a large expanse of white & a small face would be too boring. 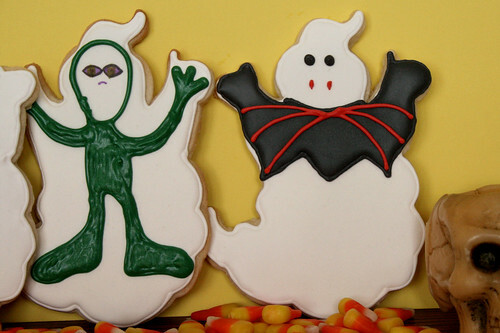 However, most ghosts don’t look that different, you know? So I thought some more. THEN, I came up with a great idea! 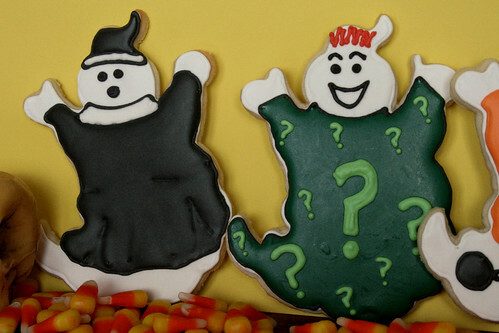 You know how in shows & cartoons & comics, there’s always a character dressed up as a ghost? Usually it’s the one who didn’t think ahead, right? Even in cute Halloween decorations I’ve seen, there have been witches & goblins dressed up as ghosts… but never the other way around. I could make GHOSTS, but costume them up as OTHER CHARACTERS!! 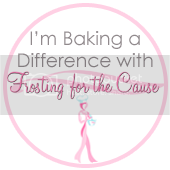 And the super-large cookie cutter gave me just the space for details that I would need – yay! But keep in mind that I was still such a newbie last fall. 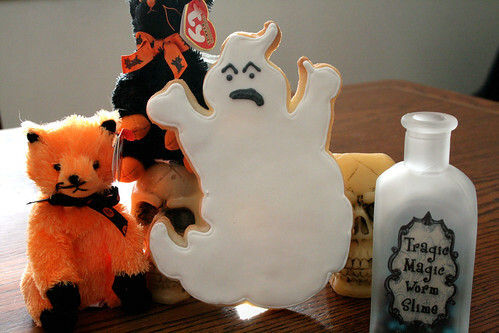 And so, without further ado, here is my 2010 Halloween Ghost Collection! 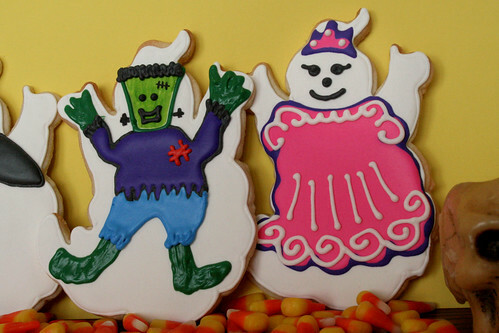 Ghosties dressed up as Frankenstein and a Princess. A Superman, Vampire, and ol’ Frankie. What’s this? 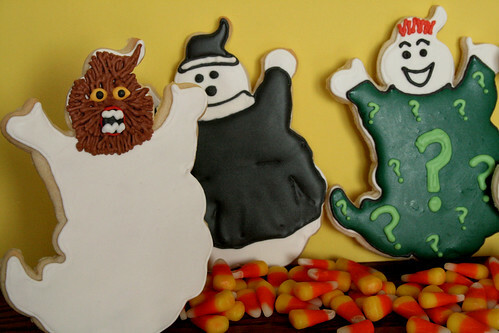 Something is terrorizing the happy, little Ghostie neighborhood! 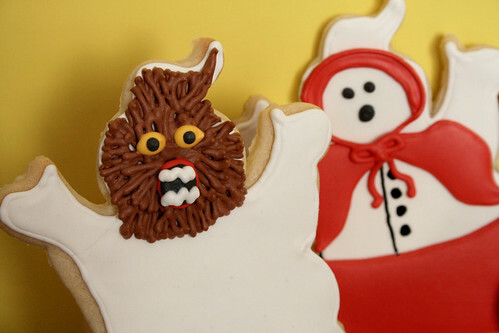 A scary Werewolf frightens Lil’ Red Riding Hood. 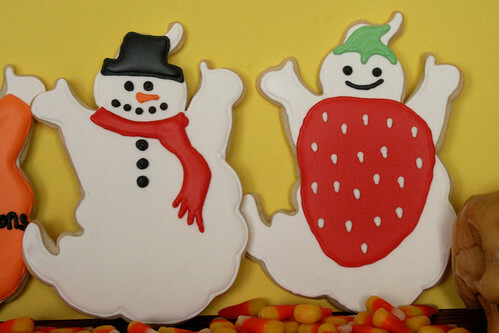 A Snowman and a Strawberry – how adorable! 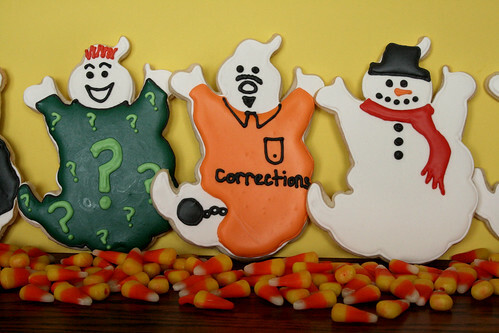 And then The Riddler and an Inmate wander through with the Snowman. 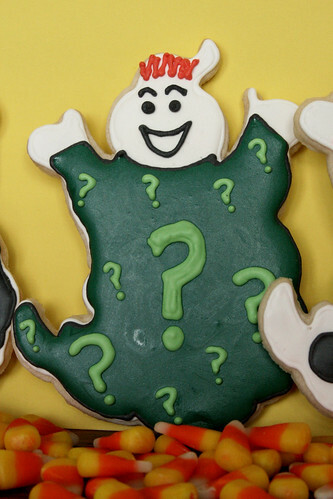 But I gotta say that The Riddler was my very favorite of the set! And oh, no! Here comes the Werewolf again! 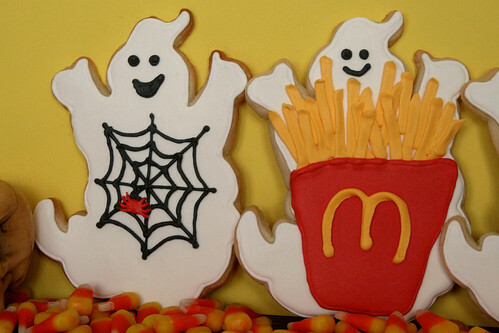 Or maybe this Spiderweb and McD’s Fries? But mean ‘ol Werewolf runs them off as well! A handsome foursome of regular Ghosties floats by… and the two on this end are still pretty happy. But the two on this end are stricken with surprise and fear! 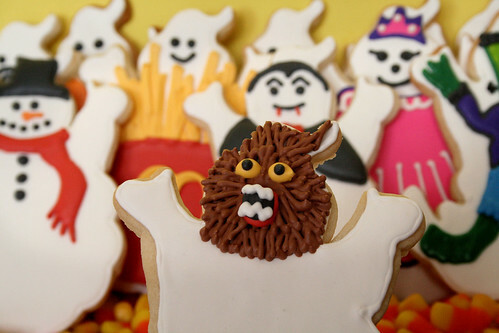 With the Werewolf off chasing the regular Ghosts, the trick-or-treaters are able to continue on their merry way, shuffling as a giant bunch from door-to-door. At last, all is well. 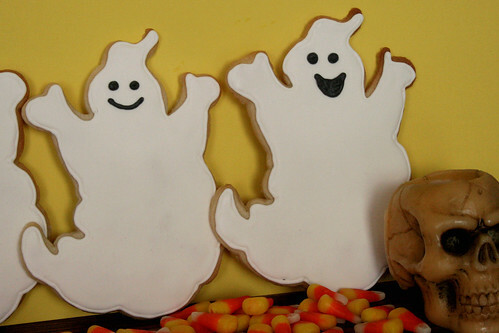 We gave away these 19 large Ghosties in “Boo!” bags to my boys’ friends last year. 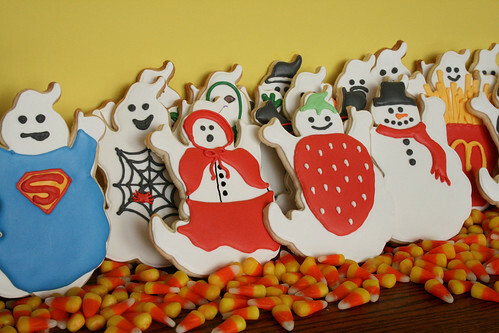 They enjoyed dashing from doorbells, hiding before their friends could catch who gifted them. 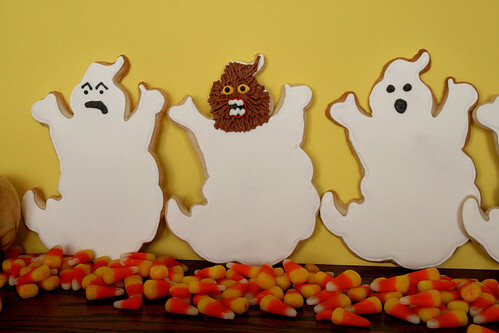 AND, I like to think the kids who received these Ghosts thought they were the best thing ever! Oh, aren’t you glad I’ve gotten better since then, at both cookies AND taking photographs of them? I sure am! These are awesome! 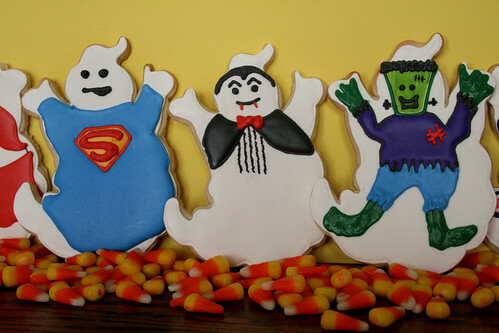 I cant wait to see photos of this year’s halloween cookies! They may not be perfect, but they sure are creative! And cute! OMG Nicole, these are so adorable and so much fun. 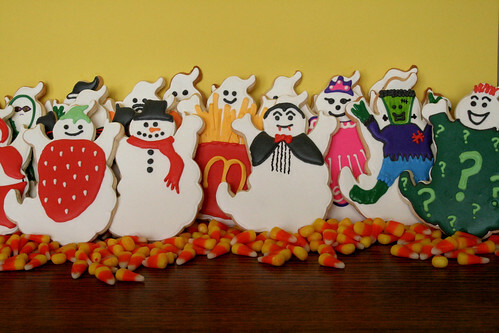 I can’t believe that you decorated so many different ghosts in costumes! You are so creative. Who would have thought to do an inmate with Little Red Riding Hood, a Nun and a box of McD’s fries?! You are fabulous and a ton of fun. Well – thank you for being brave and sharing your ‘before’ cookies. Really, I think they’re great! (Much Greater than my own before cookies – which is the phase I’m actually in now.) And Sooo creative! I like the way your mind works These are pretty dern good and creative for ‘before’!